'Adding Machine 10Key for iPad' behaves like a true '10 Key' or 'printing calculator' such as those made by Monroe, Casio, Sharp and others. A total is obtained by pressing the asterisk (*), operator entry is reversed, and percentages are obtained by multiplying and adding to a stream of numbers. PLEASE SEE THE 1ST FAQ BELOW. Adding Machine features a full sized (1:1) keypad with TypeTone, a unique audio aid to help guide your finger back to the center of a key. The total (*) key can be on either the left or right side (Sharp or Canon style). Also. Review & edit numbers, add or delete lines. Save & retrieve paper tape files. 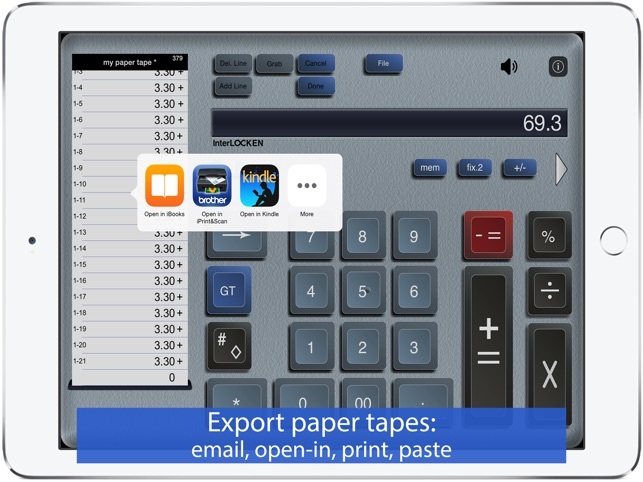 Export paper tape files to iBooks©, Dropbox©, Email or your favorite printing utility (see the FAQs). Try before you buy. 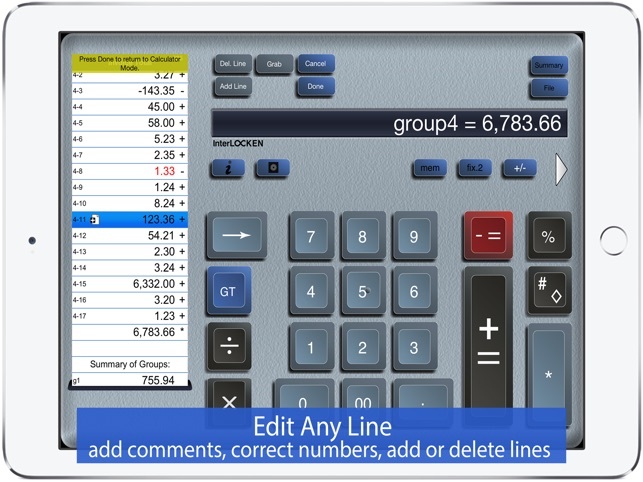 Find our 'Adding Machine 10Key iPad Lite' by Richard Silverman in the App Store. Currently featured in iTunes "What's Hot" in the Finance Category. 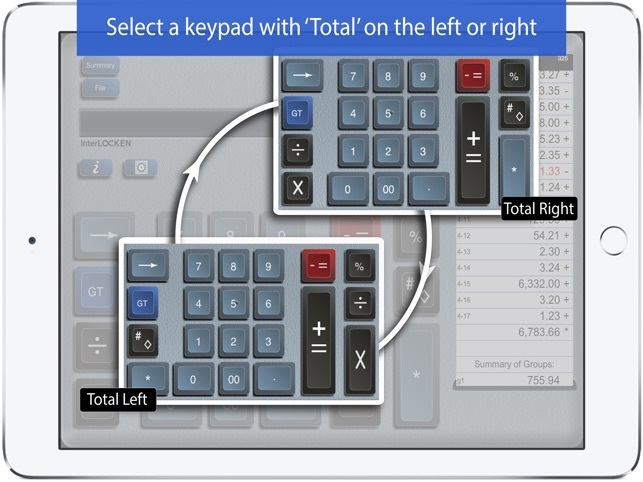 Strategic Finance (Tools of the Trade): "If you're looking for a professional desk calculator that can give you full 10-key accounting functions with a tape you can name and save, edit, e-mail, or print, check out Interlocken's 10 Key for iPad." ● Behaves the same as a '10 Key' adding machine. ● Export a PDF file to iBooks©, DropBox©, Email, or your favorite printing utility. ● TypeTone - a major innovation to aid accurate key entry using audio feedback. ● Full size (1:1) keyboard. ● Select from a menu of keypad sounds. ● 400 lines of paper tape history (full version). ● Save paper tapes to disk for later use. ● Comprehensive set of help screens. ● International number formatting (Settings -> General -> International -> Region Format -> select region). Q1. What is the difference between 'Adding Machine 10Key for iPad' and 'Accountant for iPad' in the App. Store.? A1. 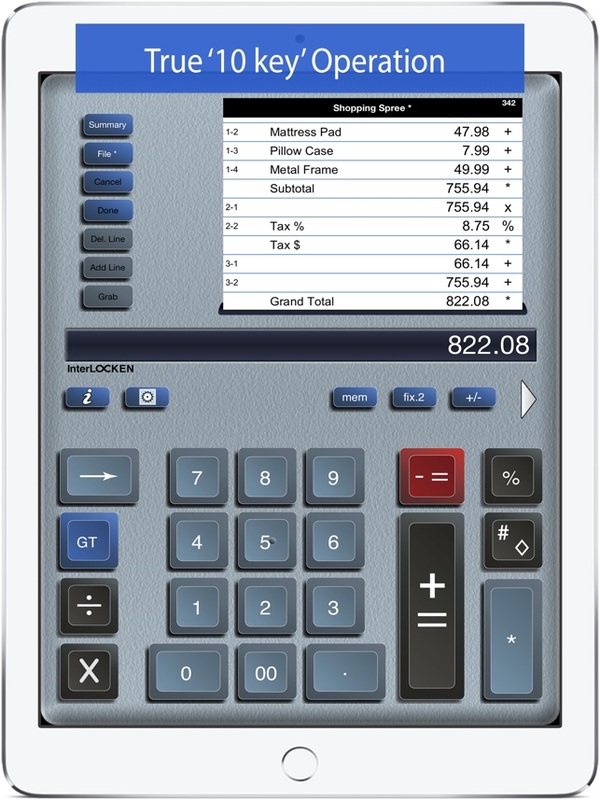 Both calculators are single-column adding machines or calculators with full-size (1:1) keypads and are optimized for the iPad User Interface. '10 Key' behaves the same as a 10 Key Adding Machine with reversed operator entry while ‘Accountant for iPad’ supports the free chaining of +, -, x, /, %, √, 1/x and is easier to use if you are not familiar with how a '10-key' works. A2. 'Adding Machine 10Key for iPad' comes as close to touch-typing as a touch-screen can be. v2.1 introduces TypeTone. With TypeTone, a key will guide your finger back to the center of a key with an audio tone. Q3. How can I edit an incorrect number or add & delete lines from the paper tape? A3. Touch any line of the paper tape to go into edit mode. Touch the side controls: Add Line, Delete Line. You can also edit numbers, split Add/Sub or Mul/Div groups. Press Done to return to Calculator mode. Q4. How can I quickly clear the paper tape? A4. The quickest way is to double-tap the calculator's LCD display. 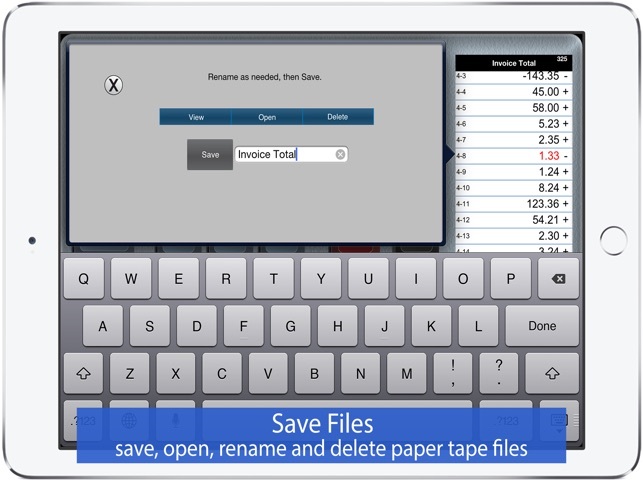 See the 'Clear the Paper Tape' topic by pressing the 'i' (info) key in the upper left corner of the App. Q5. Tell me about Email, Printing, and Exporting a Paper Tape. A5. From the Export dialog, select from: Email, Print, Copy or Open-In. Email includes a pdf attachment. Print requires an AirPrint capable printer. Open-In will cause a menu of 3rd party Apps to appear that can receive a hardcopy of your paper tape; for example, iBooks, DropBox, and 3rd party printer Apps for Brother, HP, Epson, Canon and more. With these print directly to a network reachable printer (even if it is NOT AirPrint capable). 1. Errata was repaired that repeatedly asked user to 'review this App'. I was so happy to find this app! 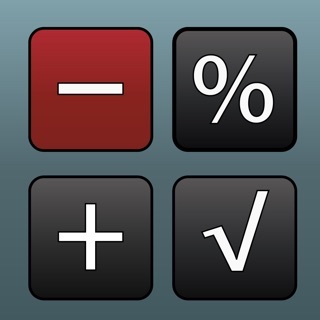 If you're looking for a traditional adding machine, this is the app for you. It works amazingly well on the touch screen because they were clever enough to make it click when you tap a key and it makes a different sound if you don't hit the key squarely, so you can look and make sure you haven't made a mistake. This makes it possible to enter numbers without looking closely at the keys. Great design -- I love it! Also love the latest update... Now able to clear the tape with a quick double tap. Nice! Wonderful app for anyone who misses the features missing in almost all other computer & device apps. The old Adding Machines couldn't hold a candle to today's calculators. But what they did well hasn't been matched until now. Having the virtual paper tape, and fast entry without entering a decimal point every time is super. And guilt free: no paper to throw away or recycle! 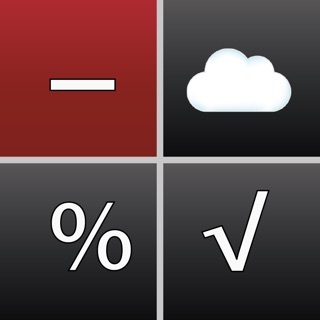 Needed a Adding Machine App that keeps track but let’s me edit as I am doing my calculations. This is it. Thank you for such a great app. This is one of those apps that you use the free version and then see how great it works and want to give the developer money for such a great job. Try it yourself.